Please come out to support a worthy cause. My friend PESU, an artist from Japan and an ARTBATTLES vetran, has put together a live painting event by the Lions Club in Times Square. There will be many awesome artists painting live over the course of 5 hours. 100% of the proceeds and donations will go to outreach missions in Japan through the Japanese American Lions Club. The disaster of last year is no longer top news but the country and people are still really hurting. So many awesome artists and it’s supposed to be sunny and warm, perfect way to spend your saturday! Amy Isd + Andre Trenier + Erin Cadigan + Lexi Bella + Riz Robinson + Marthalicia Matarrita ……and many many MORE !!!! 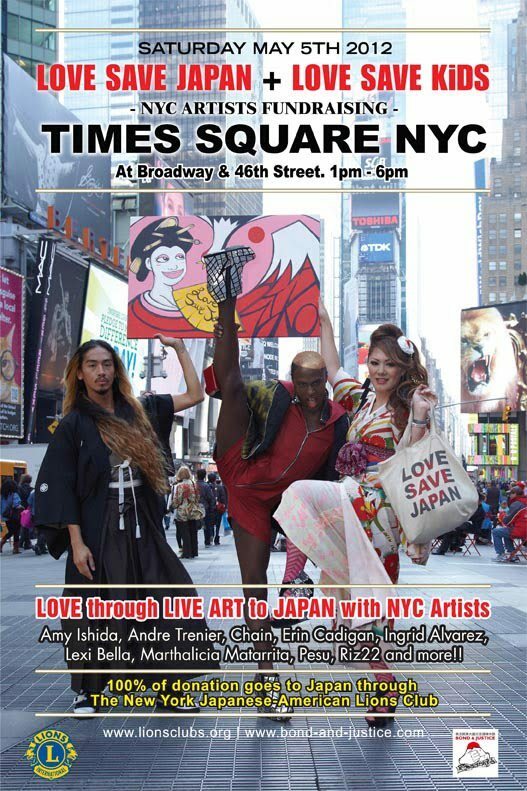 This entry was posted on May 4, 2012 at 10:12 pm and is filed under Community posts, EVENTS, Uncategorized with tags art, erin cadigan, events in nyc, live painting, love saves japan, things to do may 5, THREE Erin Cadigan, Times Square. You can follow any responses to this entry through the RSS 2.0 feed. You can leave a response, or trackback from your own site.